Not everyone is a fan of the humble cauliflower. I get that. But we've enjoyed a good number of tasty cauliflower recipes together over the years, no? My hope is that the cauliflower curry or the lemon-zested sauté converted at least a few of you who were on the fence? If not, maybe this next recipe will. It's no joke. Imagine a skillet of caramelized onions cooked down with fragrant cumin, ginger, garlic, sesame seeds and chiles. Add cauliflower and cook until tender. Vibrant, spicy, sweet earthiness all on one plate. The inspiration for the recipe comes from Reza Mahammad's lovely cookbook, Rice, Spice and all Things Nice. I bought a copy and slipped it into my suitcase the last time I was in Portland, and I'm finally(!) getting around to cooking from it. I'm always on the look out for approachable Indian recipes, and this book is full of great ideas and beautiful photos. It seems that with a tweak or two, I can turn a good number of the recipes into one-pan weeknight meals. For example, with this cauliflower, you might toss in a couple handfuls of grilled or pan-seared paneer cheese or tempeh. 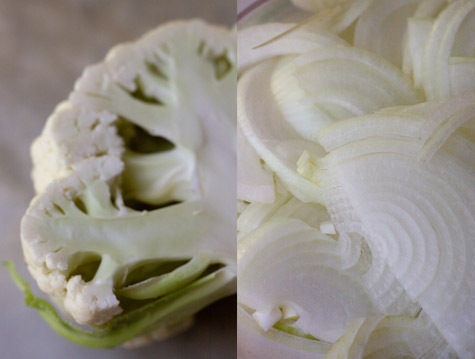 Give this a try, even if you don't think you're much of a cauliflower fan. It's that good. I can also imagine doing a creamy soup version of this - with a pureed cauliflower soup base topped drizzled with an oil infused with the cumin, turmeric, garlic, and chiles....topped with toasted sesame seeds and some sort of flatbread croutons? Also! I know some of you are starting to think about Thanksgiving menus, I figured I'd update and bump up my favorite vegetarian Thanksgiving recipes, as well as my favorite vegan Thanksgiving recipes. I went through and swapped out a few old favorites and swapped in a few new ones. And lastly, on a complete side note and unrelated to anything to do with cauliflower - I want to tell you about a new, secret-until-now section of my site. I figured I'd bury a note here for those of you who read to the end. Here's the jist of it: I'm dying to know what your favorite cookbooks are. And beyond that - I'd love to know which recipes are your favorites from those books. I think I've found a way for us to share this sort of information with each other. So...Let's say you have two favorite recipes from Deborah Madison's Vegetarian Cooking for Everyone, you can now share your thoughts here. Last weekend I bought Amanda Hesser's The Essential New York Times Cookbook. I made Bill Granger's Scrambled Eggs for breakfast yesterday, and have a slight twist on the Poppy Seed Torte headed for the oven. I can make notes here. While you can use the new library system to make note of favorite recipes from any of your cookbooks, I thought it might be fun to also casually focus on a single book for a couple weeks at a time. What do you think about choosing a group cookbook? I have a list of recipes as long as my arm to try from The Essential New York Times Cookbook, so maybe we can start there? I'm not exactly sure how this is going to play out, but let's give it a shot. Who's with me? Heat the oil in a large skillet over medium-high heat, add the cumin seeds and cook until they begin to crackle, just 30 seconds or so. Stir in the onions, along with the turmeric and a few pinches of salt. 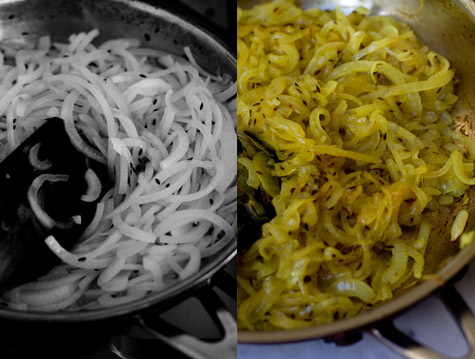 Cook, stirring often, until the onions caramelize a bit and turn lightly golden, roughly 7 - 10 minutes. Add the red chiles, sesame seeds, garlic, and half of the ginger. Continue to cook for another minute. Add the cauliflower and stir well. Cover the pan and cook the cauliflower over low-medium heat for 3 - 5 minutes, until just tender. Adapted from Reza Mahammad's lovely cookbook, Rice, Spice and all Things Nice.